Trump, Cruz, Campaign in N.H.
As the feud between Trump and Cruz heats up, Granite Staters got the chance to hear from both candidates in person on the same day. 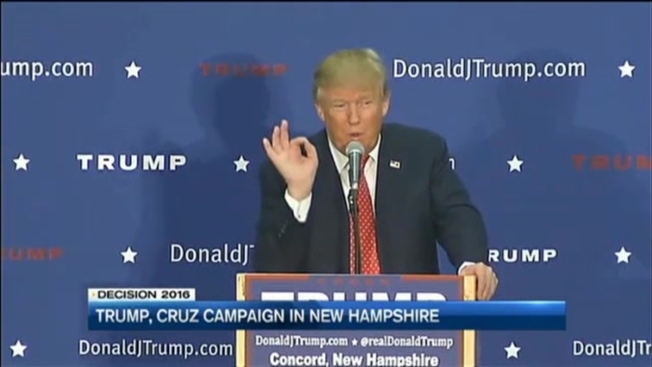 Trump, Cruz Spar in N.H. The Iowa Caucus is two weeks away and the new Hampshire Primary is three weeks from Tuesday, Monday, two Republican frontrunners, Donald Trump and Texas Senator Ted Cruz stopped in New Hampshire. In Concord on Monday afternoon Trump made a big promise to First in the Nation voters. "There's a big move to move you to the middle of the pack, that's not going to happen, if I win, not going to happen," Trump said. Merrimack resident Michael Bourque said Trump is the man for the job. "I think he's transparent and I believe it's time for change," Bourque said. Just about 35 miles away in Washington, New Hampshire the business mogul's biggest competition, Texas Senator Ted Cruz hosted a town hall event and spoke to reporters beforehand. "Donald seems to be a little rattled," Cruz said. Cruz is beating Trump in the latest Iowa polls and gaining momentum in the Granite State. "My mind was made up a long time ago for Ted Cruz," said Washington resident Kirstlyn Dube. The two men who months ago supported each other are now in the throws of a heated back and forth. Over the weekend, Trump called the senator a "nasty guy" who no one likes. "I have no intention of responding in kind," Trump said Monday. "If he wants to engage in insults that's his problem, I like Donald Trump, I respect Donald Trump." Cruz though is calling out Trump for what he considers questionable conservative values. "At the end of the day the American people will decide who is telling the truth, who is, in fact, been a consistent conservative, not who has adopted conservative language on the campaign trails, but who has walked the walk," Cruz said. We found three voters who spent the morning with Cruz and the afternoon with Trump. "It's important to get the contrast between two different candidates," said Maine resident Nick Godin who drove to both events in New Hampshire Monday with his friends. Josh Cale, a Massachusetts resident, was a Trump supporter this morning, that is, until he heard from Sen. Cruz. "I'm leaning toward him now, because he has more Christian values and I'm Christian," Cale said. Comparing candidates side by side and in person is a privilege and responsibility New Englanders take seriously. "I think it's very exciting, I think people in New Hampshire have a great role in this," said Goffstown resident Steve Brzozowski. Cruz has campaigned in the Granite State fewer times than Trump. Monday was day two of a five-day, 17-stop bus tour for Senator Cruz in New Hampshire. To see his other stops, click here.